This policy brief was prepared under contract between the U.S. Department of Health and Human Services (HHS), Office of Disability, Aging and Long-Term Care Policy (DALTCP) and LifePlans, Inc. For additional information about the study, you may visit the DALTCP home page at http://aspe.hhs.gov/_/office_specific/daltcp.cfm or contact the ASPE Project Officer, Hunter McKay, at HHS/ASPE/DALTCP, Room 424E, H.H. Humphrey Building, 200 Independence Avenue, SW, Washington, DC 20201. His e-mail address is: Hunter.McKay@hhs.gov. This data brief is one of six commissioned by the Department of Health and Human Services, Office of the Assistant Secretary for Planning and Evaluation to analyze survey data collected by Long Term Care Partners from members of the federal family regarding the long-term care insurance offering available to them. This brief provides insights into the characteristics of LTC insurance buyers, the level of coverage they purchased and their level of understanding of their policy. The remaining briefs address: a Profile of Buyers; a Profile of Non-Buyers; a Profile of Non-Responders; a Comparison of Active and Retired Buyers, Non-Buyers and Non-Responders; and a Comparison of Engagement and Participation among Buyers, Non-Buyers and Non-Responders. A Literature Review is also available. One of the more ambitious proposals for encouraging growth in the private insurance market was the passage of the Long-Term Care Security Act (Public Law 106-265). This act was passed in the summer of 2000 and was signed into law on September 19th of that year. It authorized the U.S. Office of Personnel Management (OPM) to contract for a long-term care (LTC) insurance program for federal employees. Medically underwritten coverage was made available to active federal employees and annuitants (civilian retirees), as well as active and retired members of the uniformed services. It was also made available to 'other qualified relatives,' who would include current spouses of employees and annuitants, including surviving spouses of members and retired members of the uniformed services who are receiving a survivor annuity, adult children of living employees and annuitants, and parents, parents-in-law, and stepparents of living active employees. Because this coverage is medically underwritten, certain medical conditions prevented some people from being approved for coverage. OPM expected that, like the health and life insurance programs it administers, the Federal Long-Term Care Insurance Program (FLTCIP) would become the largest employer-sponsored LTC insurance program in the nation. Naturally it was expected that implementation of the program would spur additional interest and growth in the market. The program began in earnest in July of 2002, which constituted the beginning of the open enrollment period. The carriers underwriting the program -- John Hancock and MetLife -- formed a joint venture called Long Term Care Partners, LLC, which is devoted exclusively to administering the program. Long Term Care Partners conducted one of the largest LTC educational campaigns ever. More than one million people requested enrollment kits. As of August 2003, 273,000 applications had been received. About 64% of enrollees were active employees and spouses, 31% annuitants and their spouses, and another 5% surviving spouses, parents/in-laws and adult children. Thus, in relatively short order, the FLTCIP became the largest group programs in the United States. In part this was due to the significant marketing and enrollment activities including more than 2,100 educational meetings, briefings to human resources staff and outreach programs to affinity groups. The large number of enrollments affords a unique opportunity to better understand the attitudes and perspectives of both working and retired individuals regarding LTC concerns, the importance of planning, and the role that insurance may (or may not) play in meeting the needs of disabled individuals. An examination of such attitudes can assist policymakers as well as insurers to better understand marketplace opportunities and barriers, and devise strategies to encourage growth in the market. The purpose of this project is to analyze survey data collected by Long Term Care Partners from members of the federal family regarding the LTC insurance offering available to them. The analysis focuses on the attitudes, opinions and motivations of both active employees and retirees who have enrolled in the program ("buyers"), those who have expressed an interest in the program but chosen not to enroll ("non-buyers"), and those who are members of the federal family but have not enrolled or expressed any interest in doing so ("non-responders"). As part of this project, we also compare the results to available data from other studies of non-federal buyers and non-buyers in both the individual and group markets. In this way we are able to determine the extent to which there are significant differences, which could influence both the marketing and future design of LTC insurance. Finally, we examine specific issues within each of he three sample groups. What are the characteristics associated with being a purchaser/enrollee in the FLTCIP? Among those who purchase policies, what are the characteristics associated with the purchase of various levels of coverage, that is, more compared to less comprehensive coverage? Among those who purchase policies, what are the characteristics associated with not having a full understanding of the policy purchased? Put another way, who are the buyers who do not fully understand major elements of the coverage that they purchased? Answering these questions is important from both a marketing and education perspective and can inform future strategies as the Federal Government continues to rollout the LTC insurance program. We use logistic regression techniques to uncover the factors related to the purchase/non-purchase decision. This is the analytic method of choice when the dependent variable is dichotomous: buy or not buy. The explanatory variables (regressors) include demographic, attitudinal and experiential factors. The logistic regression is estimated for retirees and for active employees together. To determine the factors related to the "comprehensiveness" of the purchased policy, we rely on two different methods of analysis. First, we develop a set of age-adjusted premiums for each individual in the sample as a proxy for policy value. That is, by holding age constant and generating a premium for each individual in the sample, we can determine policy value for their chosen policy design. More comprehensive policies have higher premiums associated with them.1 Because the dependent variable is continuous, we employ standard regression techniques to identify the significant variables. A second method is to classify policies in terms of their features. For example, the most comprehensive policy offered is one covering nursing home and home care, containing a high daily benefit, a long duration, and having automatic compound benefit increases built into the premium structure. The least comprehensive policy is one that only covers nursing home care, has a short duration of coverage, low daily benefits, and does not have automatic benefit upgrades built into the policy. We use ordered probit to identify the factors associated with choosing one of three policy types: "comprehensive coverage," "moderate coverage," or "modest coverage." Ordered probit is the analytic method of choice when the dependent variable is more than two categories and values imply a certain ordering along an index, in this case, an index of comprehensiveness. The third analysis focused on the issue of policy design knowledge. All buyers/enrollees were asked specific questions about the policy features that they had purchased. Their answers were then compared to administrative data provided by the insurance company on the actual features purchased. About one-third of active buyers and 38% of retirees did not know at least one of their policy design features. To determine the factors related to their level of knowledge we again employed logistic regression analysis. In this case the dichotomous dependent variable was defined as "knowing all policy features" and "not knowing at least one feature". All survey data for the study was collected between January and April 2003.2 The final samples on which the various analyses in this brief are based include 642 active buyers, 575 active non-buyers, 1,114 retired buyers and 586 retired non-buyers. These sample sizes are sufficient to enable meaningful testing of a variety of possible explanatory variables. As mentioned, roughly 270,000 individuals applied to the FLTCIP, thus making it the single largest employer sponsored program in the United States. While this is certainly a marketing accomplishment, many millions of individuals were exposed to the marketing and education campaign and more than one million individuals requested information and/or application kits. Therefore, a sizeable number of individuals considered purchasing the program, but ultimately decided not to do so. We are interested in understanding the reasons or factors behind this decision. Regarding demographic characteristics, the potential impact of advancing age on the probability of purchase is not straightforward. On the one hand, age might be positively related to the probability of purchasing a policy because the risk of needing LTC increases with age. On the other hand, because premiums increase with age, the perceived affordability of policies may decline, thus suggesting a negative relationship. Regarding gender, women are at greater risk of needing formal (paid) LTC, so we expected that being female would be positively associated with the purchase decision. Finally, because there is a great deal of confusion among the general public about the extent and limits of public coverage for LTC we posited that the more highly educated would be more likely to purchase policies. LTC insurance is not cheap and most non-buyers cite policy cost as the primary reason why they chose not to buy a policy.4 Therefore, other things being equal we expect that as wealth increases, that is, the level of income and assets, the probability of buying a policy would also increase. Regarding family situation, the relationship to insurance purchase is not so straightforward. On the one hand, if an individual has children living nearby, then perhaps there is less of a need for the insurance; if a disability develops, one can rely on children for help rather than formal (paid) care. On the other hand, most individuals do not want to have to rely on children for help should they require it. Therefore, the presence of children nearby may provide a positive incentive to purchase the insurance. Finally, one would expect that having had caregiving experience would educate one to the need for insurance. Therefore, we posit a positive relationship between caregiver experience and the probability of insurance purchase. Regarding risk, we anticipate that those who believe they are at higher risk for needing the services that would be paid for by the insurance are also more likely to be purchasers. Moreover, if there is a belief that in the absence of insurance, the potential LTC liability would be borne almost exclusively by the individual and/or his family, then the probability of being a buyer ought to go up. We also hypothesize that those individuals who view retirement planning as something that is important to do will also be more likely to be purchasers. Lastly, we expect that the process of learning about the federal program and impressions about the application process could influence whether or not someone ultimately became a buyer. For example, we expect that individuals who find the application to be easy to understand, find it easy to get answers to their questions, and engage in "active" educational opportunities will be more likely to purchase a policy.5 Each of these three variables is tested in the equation. Table 1 summarizes the results of the logistic regression analysis. The odds ratio for each variable indicates the odds of being an insurance purchaser given a particular trait compared with not having that trait. For example, married individuals are only .57 times as likely to buy a policy, as are single individuals. Put another way, other variables held constant, being married is negatively associated with purchasing the federal product. Advancing age is negatively associated with the probability of purchasing a policy. Because older individuals considering the purchase of a policy face higher premiums and tend to be on fixed incomes, they may perceive the insurance as somewhat less affordable than younger individuals. Gender is not a significant differentiator between buyers and non-buyers. This is in spite of the fact that women face a much greater probability of requiring formal (paid) LTC services when they age. As mentioned, married individuals are only .57 times as likely to buy a policy, as are those who are single. This suggests that singles may view the insurance as a substitute for the lack of available spousal care should a LTC need arise. Or it may be the case that because married couples would have to pay twice as much as singles, there is a reluctance to spend the money on two policies. This result differs from findings in the individual market where married individuals are more likely to buy policies. This may reflect the fact that in the individual market, significant premium discounts are available to married buyers whereas the federal program did not offer such discounts.6 Thus, there is a financial incentive for married individuals to purchase policies in the individual market and no such incentive in for potential buyers of the federal program. Individuals who have children nearby -- living in the house or within 25 miles -- are only .76 times as likely to purchase insurance as are those who either have no children or have children living more than 25 miles away. This may be related to the fact that the former have competing demands on their resources and are therefore less likely to see the purchase of insurance as a present priority. Or, perhaps those with fewer available family supports may understand that the insurance can help to substitute for care that may otherwise have been provided by adult children, should the need arise. Increasing wealth is typically associated with the purchase decision. Those with incomes greater than $50,000 are 1.5 times more likely to buy a policy than are those with incomes below this amount. Moreover, those with liquid assets greater than $150,000 are 1.7 times as likely to buy a policy than those with lower levels of assets. The strong association with asset levels is not unexpected given that many individuals purchase the insurance precisely to protect their assets should they require LTC (See Brief #1). Education level is also positively associated with purchase. Individuals with a college education are 1.4 times more likely to purchase a policy than are those without a degree. LTC insurance can be a complicated product to understand and for many, being able to think ahead to possible needs 20 to 30 years into the future is difficult. Moreover, confusion about public coverages for LTC is widespread. Those with higher levels of education may have a better understanding of the product as well as shortcomings in public coverage. The purpose of insurance is to pay a known and certain premium to minimize an unknown and uncertain risk. Therefore, one would expect that those who believe that they are at higher risk for needing care, even if it is well into the future, would be more likely to purchase policies. Indeed, individuals who believe that they are at high risk for needing institutional care, that is, have a greater than 60% chance, are 1.5 times more likely to buy policies as those who believe there risk to be lower than this. The same cannot be said of the risk associated with home care, although individuals who believe that they will need help with personal care activities are less likely to be buyers. Either they are self-selecting out of the insurance program due to perceived current or near-term poor health, or because the financial risk associated with care provided in non-institutional settings is far less and they see no need to insure against these costs. Having had caregiving experience also affects the probability of purchasing a policy. Those who have had such experiences are 1.3 times more likely to purchase a policy. In terms of attitudinal variables, individuals who understand that in the absence of insurance they will have to pay for care, are much more likely to buy the insurance than are those who do not understand this. Moreover, individuals who view LTC insurance as an important part of an overall retirement plan are also more likely to be purchasers. This variable has the single largest effect on the probability of buying a policy. In terms of the process associated with obtaining information about the program, those who actively sought ought information were three times more likely to purchase the program than were those who did not do so. Finally, individuals who found the application difficult to understand and those who found it difficult to have their questions answered were far less likely to purchase the insurance. This underscores the importance of an easily comprehensible application as well as the importance of responsive customer service during the time of initial application. In an attempt to reach as broad a "customer" base as possible, members of the federal family were offered a variety of choices regarding insurance policy designs. One could purchase one of three standard packages or a customized package. Features that varied included services covered (e.g., institutional only versus comprehensive coverage for institutional and non-institutional services) the duration of coverage (three years, five years, or lifetime protection), the elimination period (30 or 90 days), whether payment limits were to be figured on a daily or weekly basis, the level of daily benefits, and whether an individual wanted automatic compound inflation benefits or the option to purchase benefit upgrades in the future. In this section, we focus on identifying the factors associated with buying policies of a particular "level of value". We measure value in two ways. First, we remove the effect of age from gross premiums in order to determine an age-adjusted premium for each combination of policy design features. Thus, the resulting age-adjusted premium is solely a function of the policy design parameters chosen by an individual. As such, the higher the policy premium, the greater the value in the policy. We also analyze the data by classifying policies into three discrete classifications of "comprehensiveness" which are a function of policy design features. The dependent variable takes on the value of three when the policy has the "richest" combination of features, that is, it covers services received at home and in a facility, has a benefit period of five or more years, and has automatic compound inflation protection. The dependent variable is equal to one, designating the policy with the "least comprehensive" combination of features, when the policy duration is three years, or five years for an institutional-only policy, and does not have automatic compound inflation protection. The dependent variable is equal to two when the policy has any other combination of features. We estimate an ordered probit model that determines the factors associated with an ordered outcome where larger values of a dependent variable correspond to "higher" or "better" outcomes. We assume that people who purchase more comprehensive policies will have higher levels of income and assets, will have had caregiving experience, will be highly educated and are more likely to be active employees rather than retirees. On the other hand, we expect married couples and those with children in the house or living nearby to purchase less comprehensive policies. We also posit that those buyers who believe that having a policy is particularly important to retirement planning, will buy higher levels of coverage. Finally, everything else held constant, we anticipate that those buyers who found the application easy to understand and who could readily obtain answers to questions would buy more coverage. Table 2 summarizes the results of the two analyses. The regression model is the more robust, since much of the variance in the dependent variable -- age-adjusted policy premium -- is maintained and not collapsed into one of three categories. Most of the variables are significant in both specifications. The exceptions include employment status, having children nearby, and whether it was easy to understand the application. In the discussion that follows, we focus on the results of the regression equation. Advancing age, marital status, and having difficulty understanding the application are negatively associated with the purchase of more comprehensive policies. Because premiums increase with age at purchase, this result is not surprising. As well, married households would have to spend twice as much for the same level of coverage as single policyholders and there may be reluctance to insure only one member of a couple. Couples appear to trade-off comprehensiveness in order to assure that both individuals have some level of coverage. Regarding the application, results here suggest that not only does a difficult application reduce the probability of purchase, but among those who do choose to buy a policy, a less comprehensible application leads to less comprehensive coverage. Increasing income and having the belief that insurance is very important to a retirement plan are positively related to purchasing coverage that is more comprehensive. The regression equation also indicates that having higher levels of assets and being college educated are variables associated with the purchase of more comprehensive coverage. Moreover, holding all other variables constant, actives are more likely to purchase more comprehensive policies than are retirees. In large part this reflects the fact that the vast majority of active employees purchased policies with automatic inflation protection, a policy design feature that adds significant expense to the base premium. The final multivariate analysis is related to the finding (outlined in the Brief #1) that roughly one third of the buyers of the federal program do not know at least one feature of the LTC policy they had bought. Each buyer in the sample was asked whether their policy covered home care, whether it was a three, five or unlimited duration policy, and whether it included automatic compound inflation protection. We were able to confirm whether a policy indeed had a particular feature by comparing survey answers with the actual policy information obtained from the administrative data provided by the insurers. Again, we employed logistic regression techniques to uncover the impact of variables on the probability of knowing all three of these policy design features. Table 3 summarizes the results of the analysis. Seven variables are associated with the probability of fully understanding the policy design features purchased. Individuals with higher levels of education, income, and assets are more likely to be able to correctly identify all of the policy design features that they purchased. Moreover, those who understand that with a lack of coverage they will have to personally bear the costs of LTC are twice as likely to know their policy features, as are those who do not fully understand the exposure they would face in the absence of their policy. Somewhat surprisingly, interaction with a human resources representative or finding it difficult to have questions about the program answered did not affect whether or not someone fully understood what they had purchased. On the other hand, buyers who visited the website were 1.5 times more likely to correctly identify their policy features, as were those that did not engage in this activity. The availability of a premium calculator on the website could be used to compare the cost of alternative design features. This may have served to reinforce a deeper understanding of the design features that were ultimately chosen. Buyers who had trouble understanding the application were also more likely to incorrectly identify one or more features of the policy that they had purchased. In fact, those who found the application difficult to understand were only .6 times as likely to fully understand their policy. Finally, actives were 1.5 times more likely to correctly identify their policy features as were retirees. In this brief we have shown that a variety of demographic and attitudinal variables can distinguish between those who chose to buy the federal LTC insurance and those who did not, and can also differentiate the comprehensiveness of the coverage chosen. Clearly, individuals of greater means are more likely to be purchasers and in particular, purchasers of comprehensive policies. As well, when there is a perception that family supports may not be available when there is a LTC need, then there is a greater chance of buying the insurance. However, in contrast to the individual market, where spousal discounts are available, married couples in the federal program are less likely to buy policies and when they do, they purchase less comprehensive coverage. Attitudes and experience play important roles in the purchase decision. Caregiving experience and an understanding of the risk of institutionalization differentiate between buyers and non-buyers, but have no effect on the comprehensiveness of purchased coverage. On the other hand, when the insurance is viewed (or positioned) as part of an overall retirement plan, there is more likely to be a purchase and the policy will be more comprehensive. Finally, marketing and application materials matter. If the application is difficult to understand or if it is difficult to get questions answered, this affects both the purchase decision as well as the nature of the policy bought. A difficult to understand application will also leave a policyholder uncertain as to what was actually purchased. Finally, when people engage in more active marketing activities -- web searches, discussions with human resources personnel or attendance at meetings -- they are more likely to buy policies and may also better understand what they bought. Thus, by continually refining marketing approaches, program sponsors are likely to build on the successes to date. LTC insurance premiums increase with purchase age. Therefore, one would expect a 70 year old to face much higher premiums for the same coverage compared to a 50 year old. In order to assure that the dependent variable -- policy value -- is a function solely of policy features, the premium was converted into a standardized premium where age is the standardizing variable. 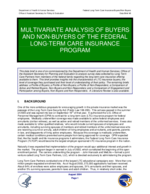 For a more complete background of the FLTCIP, see "Data Brief #1: A Demographic and Attitudinal Profile of Buyers of the Federal Long-Term Care Insurance Program" prepared by LifePlans, Inc. August 2004. For complete descriptive analyses of FLTCIP buyers, see "Data Brief #1: A Demographic and Attitudinal Profile of Buyers of the Federal Long-Term Care Insurance Program" prepared by LifePlans, Inc. August 2004. For complete descriptive analyses of FLTCIP non-buyers, see "Data Brief #2: A Demographic and Attitudinal Profile of Non-Buyers of the Federal Long-Term Care Insurance Program" prepared by LifePlans, Inc. August 2004. "Active" participation in educational activities includes talking to human resources professional, or colleague(s) about the program, attending educational meetings, or actively seeking out information on the program's website. Reading banner ads, general articles, or bulletins about the program is not considered to be more "passive" education. It is important to note that in not offering a spousal discount, the FLTCIP was able to make premiums somewhat more equal across all of its members (by not having to compensate for offering a discount). The pricing of the FLTCIP was also favorably impacted by the fact that they do not have to pay agent commissions. This policy brief was prepared under contract between the U.S. Department of Health and Human Services, Office of the Assistant Secretary for Planning and Evaluation, Office of Disability, Aging and Long-Term Care Policy (DALTCP) and LifePlans, Inc. For additional information on this subject, or to view the other briefs in this series, you can visit the ASPE home page at http://aspe.hhs.gov, the DALTCP home page at http://aspe.hhs.gov/_/office_specific/daltcp.cfm or contact the ASPE Project Officer, Hunter McKay, at HHS/ASPE/DALTCP, Room 424E, H.H. Humphrey Building, 200 Independence Avenue, S.W., Washington, D.C. 20201, Hunter.McKay@hhs.gov.